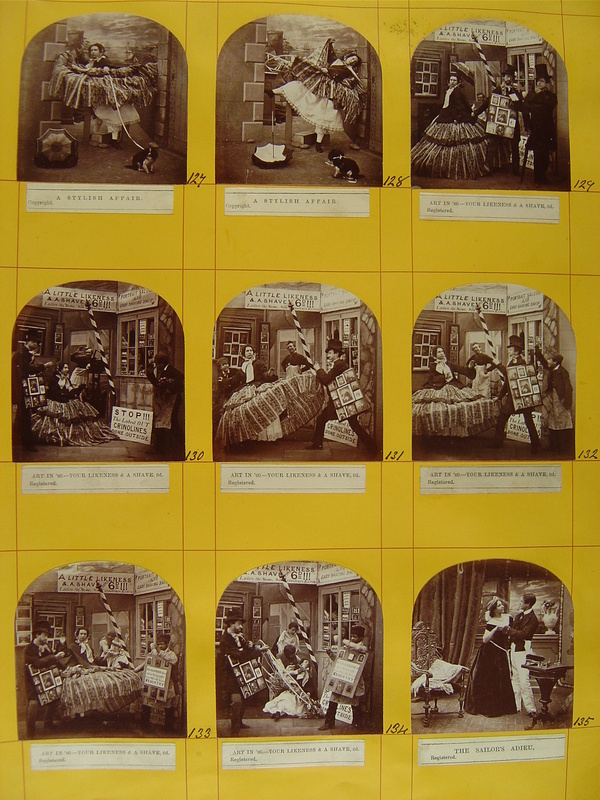 Photographer and publisher Michael Burr (1826-1912) at 26, Ladywood-lane, Birmingham, England was in both volume and variety easily the most prolific of the English studio genre stereo producers with a documented oeuvre of over 800 narrative 'comic' titles. If the extraordinary number of 'pirated' copies of Burr's stereos are added in, perhaps half of the surviving studio comic stereos are by Burr or copies of his work, and even copies of copies. 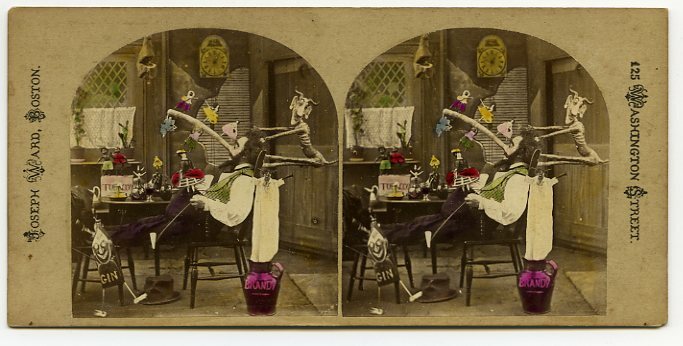 Although Burr was astonishingly productive, his stereos are seldom identified. Those that are have been blindstamped 'M. BURR PHOTO" on the front of the card at the lower left. This usual lack of identification has led to a fairly widespread misidentification of the Ashford Brothers, who were Burr's London distributors, as the photographers. Michael Burr was working roughly five to ten years after the finest early English studio genre photographers such as Elliott, Silvester, and 'Anthony' (Gaudin). There does seem to have been a trade off between quantity and aesthetics. 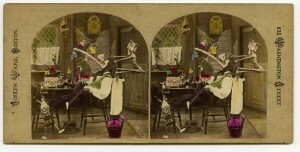 Burr's stage sets are simpler and cruder, his models plainer, and there is also the lack of the visual delight found in the earlier magical hypersteroscopic studio genre photographs of the late 1850's. In the most interesting of his work, Burr produced a unique variety of amusing subjects such as 'GUY FAWKES / Please to Remember the Fifth of November' and 'THE STORY OF A NOSE; OR A MIDSUMMER NIGHT'S DREAM'. Most of Burr's stereos come with small paper strip labels (approximately 10 x 60 mm) mounted vertically either on the front or back of the card. The printed title is followed with 'Copyright' or somewhat less commonly 'Registered.' The terms appear to have been fairly interchangeable with at least one title (“The Bird Trap”) having originally been 'registered' although it has also been seen with a 'copyright' label and a Burr blindstamp. For scholarly purposes, we have preserved the original references to 'registered' and 'copyright' as they appear in the records, but these may vary on the actual labels you encounter. The list of titles assembled here is drawn from two primary sources. 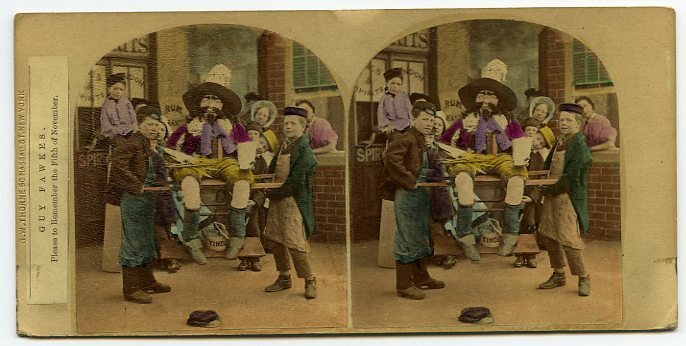 The first (see sample page illustrated below) is a remarkable photographic sample book of stereo halves with printed paper labels that was originally from the Kilburn Brothers stereo studio and which was assembled around the fall of 1866. The Burr sample book has negatives up to number 765 (Consulting the Weather Prophets) and since Burr's number 757 (Broken Vows) was registered in August 1866 we can infer the sample book was assembled around that time. Interestingly, the Kilburn Brothers stereo studio also had a second stereo sample book with an identical format of Irish stereo halves that can be attributed to Burr's Brother in Law Frederick Holland Mares of Dublin with whom he was in partnership until 1860. Clearly, Burr and Mares were still on good terms. The second source of information are the titles from the copyright deposit records located at The National Archives of Great Britain at Kew: Records of the Copyright Office: Stationer's Company. The specific Record Unit identifications are non-standard: "Copy 1" and "Copy 3". Copy 1 (1837-1912) are the entry forms which include a copy of the work being registered , the title and the claimant. Copy 3 (1842-1924) are also registers with indexes. Copy 3/104 - 3/118 cover photographs, specifically those registered between 1862 and 1883. These descriptions created a hurtle for researchers. The descriptions for the copyright registers list photographs only from 1862 onwards and queries to specialists at Kew as well as copyright experts affirm that photographs were only copyrighted from 1862 onwards. But what of the genre views by the early British photographers, marked as copyrighted or registered, and dating from the late 1850s? The answer is that prior to 1862, photographs were entered mixed in with all forms of art and publications. For all purposes, the identification of Burr was hidden from researchers unless they ignored the archival descriptions and could differentiate stereoviews from other works of art by their titles when no photograph was included with the thousands of records. There are a few views lacking from this list which date after 1873. Our research stopped at Copy 3/201 index volume 8 (Oct. 24, 1872 - Jan. 12, 1874). The next version of this list will include the balance of the entries. In addition, a few stereos have been included that can be clearly attributed to Michael Burr. Let the title list here help guide your identification efforts and expect that any 'Burr' title with the photos not mounted as two separate arch cut photographs is indeed a pirated copy. We would greatly appreciate your photocopies or scans of additional Burr titles including the labels for inclusion in the list.